Fall! It’s almost here!… The official start to the season is the autumn equinox on September 22nd. I’m sure you can already feel the shift in the air, the different slant of light and the ever-changing colors of the trees. If you read my blog or newsletters you know that fall is my absolute favorite season. Summer is pretty wonderful, of course, but I have to admit that it always feels like a huge relief when the heat and brightness of the summer sun fade into the cooler, more gentle days of autumn. There is a special sort of beauty that exists only in fall. May your autumn days be full of beauty and abundance! Elderberry is an important herb for every home apothecary, especially as we enter the colder months of cold and flu season. This syrup is very easy to make, tastes delicious and is one of the best things you can do to support your immune system. It is my go-to potion for sniffles, colds, flu, and anytime I am starting to feel run-down. Take 1-2 tablespoons a day for preventative measures and to keep your immune system going strong. This syrup is also delicious added to teas (or hot toddies! ), or as a special garnish on desserts. 1. Create a strong tea (decoction) by slowly simmering the elderberries and spices in the water. Let the water content reduce by half, which may take an hour or more. Keep an eye on the pot and make sure the water does not evaporate too much - if needed, add another cup of water. 2. Strain and discard the herbs from the liquid. 4. After adding the honey, cook on very low heat until just combined, usually just a minute or two. When using honey (especially raw honey) you want to be careful with the amount of heat you use. 5. Remove from the heat and let cool. At this point your syrup can be considered finished, but if you would like extra preservative properties for a longer shelf life, add 1/2 cup brandy. Mix thoroughly. 6. Pour into clean glass bottles, label it with the ingredients and date, and refrigerate. The syrup will keep for several months when preserved with brandy and stored in the fridge. Options: You could also add other spices such as cloves, cardamom or orange peel to this recipe. I also like to add in a small amount of dried rosehips for added Vitamin C content. Use this basic recipe as a starting point and let your creative juices flow! The combination of honey, vinegar and herbs creates an ancient preparation called an oxymel. This simple medicine dates back to the time of the Greeks and has been used for many different ailments. 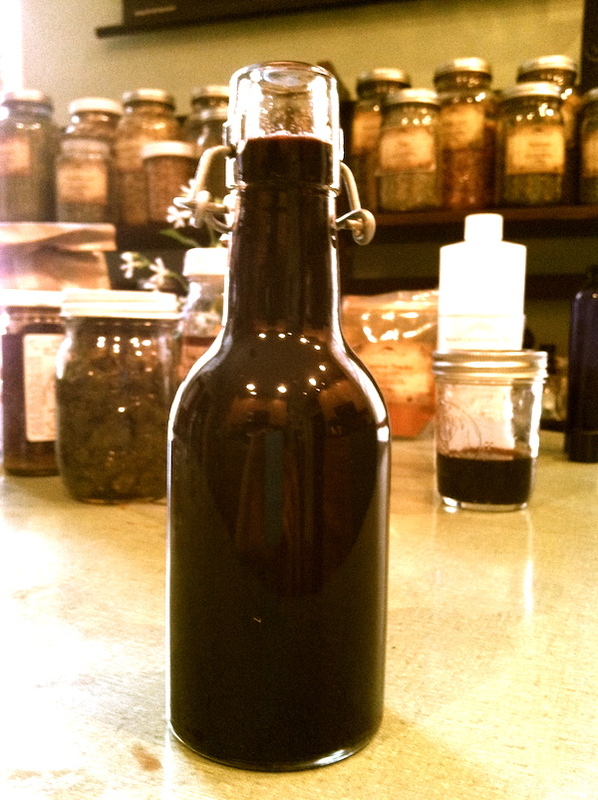 Today we can make oxymels as a delicious way to preserve our favorite herbs, or to create a medicinal tonic. Rosehips are an excellent herb to incorporate into your fall herbal routine as they are chock full of Vitamin C and help our immune systems stay healthy. Use this tart honey-vinegar concoction directly by the spoonful, or add to seltzer water for a refreshing drink. You can also use it as the base for sauces, marinades and salad dressings. 1. Fill a pint sized jar 1/3 full of dried rosehips or 1/2 full of fresh, chopped rosehips. 3. Shake those hips! Shake the jar often to make sure the herb does not clump together. Add more vinegar if necessary. 4. Let infuse for 2 – 6 weeks. Then strain out using a cheesecloth and store in a tightly capped bottle out of direct sunlight. What better way to take your fortifying ashwagandha powder than in hot chocolate?! Make this brew on cold nights -- it is lovely to sip on as you are winding down from the day. This recipe makes one serving. Pour the milk into a small saucepan and whisk in the cocoa powder, ashwagandha powder, cinnamon and nutmeg. Heat gently over low heat for a few minutes, stirring occasionally. Pour into a mug and add honey or maple syrup to your taste. Enjoy! I love this chai because not only is it completely delicious, it is also very good for you. Dandelion, burdock and chicory roots are incredibly nourishing and make our livers happy. And astragalus is a sweet-tasting, tonic root that supports our immune systems — never a bad thing during cold and flu season. The spices in this recipe add a gentle heat that stimulates both our digestion and circulation. All in all, this root chai helps us to stay toasty and healthy during the cold months. Grind together the cloves, cardamom and peppercorn in a mortar and pestle. This will help their flavor be dispersed throughout the whole tea. Combine these crushed pieces with the remaining ingredients and mix thoroughly. Store in a tightly capped glass jar. This will make about 5-6 servings of tea. To brew the tea, add up to 1 Tblsp. of the chai blend per two cups of water in a small saucepan. Bring everything to a boil, then lower the heat and let it simmer covered at for least 20 minutes. Just be sure to keep an eye on the water level and don't let it evaporate too much. When it is as dark and spicy tasting as you would like, strain out the roots and add milk and honey to taste. This unusual tea blends together some of the brightest notes of summer with our delicious New England fall fruits. 1. Place all the ingredients in a quart-sized jar. 2. Cover with freshly boiled water and let steep for 10 - 20 minutes. 3. Strain out the herbs and add raw honey or maple syrup to taste. Drink cool or warm. Mugwort is one of my favorite herbs, full of healing on several levels. It is contains many minerals and vitamins and its bitter taste stimulates the digestion. I love to use this vinegar on roasted vegetables or as a salad dressing. I also simply take it by the spoonful! 2. Cover the herb completely with apple cider vinegar, until the liquid reaches to nearly the top of the jar. 3. Stir with a spoon or chopstick to remove any air bubbles. 5. Let steep for 4 to 6 weeks, if you can bear to wait that long! Taste at intervals to see if the flavor is to your liking. When ready, strain out the mugwort through a fine sieve. 6. Place the remaining liquid in a dark colored, air-tight bottle and label. The vinegar can be left at room temperature if used within a few months. For a longer shelf life, store in the refrigerator. Gift Guide by Team Supps! As we gather goodies to bestow upon our loved ones during this expensive time of generosity and, obligation, there’s definitely room for that nonsensical gadget, useless doo-dad or might-not-ever-be-worn trinket; that said, most of the gifts that will be truly remembered this year, will be given from a place of intention and thoughtfulness. Guess what? So many game-changing presents that have the potential to really support one’s quality of life can be found in our supplement section. We’ve said it before and we’ll say it again: “Give the gift of health this holiday season!” Read on for some of our favorites. One of our favorite products just got better; Host Defense’s MyCommunity is now available in a 4oz size! It’s a mindful gift chock full of medicinal mushrooms, formulated to support the immune health of your sibling and their growing family--or anyone else you know for that matter. Also perfect for that extended family member who’s interested in biology, the science behind Host Defense is extensive and compelling. Their packaging is beautiful too! You've heard of CoQ10 before, right? It's one of the coenzymes we need for creating energy in our mitochondria -- the 'power plants' of our cells. But what about PQQ? PQQ is a novel micronutrient which has some studies showing that it boosts cellular energy production in part by creating new mitochondria. PQQ also boosts blood flow to the brain, where it may have a protective role. Unfair Advantage packs liquid PQQ and CoQ10 into an ampule for quick clean energy when you (or the one you are gifting) needs it most. For those of you eager to make a pregnant woman, nursing mother or adorable child smile, these tasty glycerin-based drops are safe for all! With Calm Drops, Sleep Drops, Teeth + Tummy Drops, Happy Drops, Balance Drops and Focus Drops, Calm-A-Mama offers the kind of botanical support that is often a challenge to come by during such sensitive life stages. Formulated with gentle herb and flower extracts, like lemon balm, peppermint, rose and hyssop, Mary Poppins would approve of these delicious drops. Collagen, the structural protein praised for its unique ability to provide much-needed strength and elasticity support for our joints, skin, nails and hair, can be found in your traditional JELLO dish, but we find Vital Proteins Vanilla & Coconut Water Collagen Peptides to be a much tastier treat. Perfect for the athlete on your shopping list, this delicious protein powder comes from pasture raised and grass fed cows, offering protein AND BCAAs. While it can be hard to stomach cold smoothies in the winter, this mix also tastes great served warm, mixed with water or your milk of choice! Winter in the Northeast can be tough: cold days, gray skies, and long nights. A wonderful way to gift a loved one a mild pick-me-up is with Nordic Naturals Omega Memory with Curcumin. Perfect for the teacher, student, or hard-worker in your life who needs a little more 'oomph,' the omegas provide brain support and the curcumin supports the reduction of overall inflammation. Adaptogenic in nature, ashwagandha is a balancing herb that supports stress relief, emotional balance and hormonal regulation. Many of us find that it zens us out and brings on a general sense of wellbeing when taken regularly and consistently. The Cambridge Naturals blend is potent and effective with both the root and the extract packing their punch. The 1oz and 2oz bottles from Urban Moonshine, Herbalogic, Bach Flower Essences, not to mention pretty much any of our herb tinctures, and individual Party Smart boxes, all make perfect stocking stuffers for grown-up family members and friends. If you are looking for functional (and yummy) treats for the same crowd, try Veggimins CBD-infused Chocolate, Yes Cacao’s Botanical Chocolate Bars, or Bulletproof Chocolate Fuel Bars. For the kidlets, consider vitamin gummies, a much healthier version of the candy that often overflows from the stockings of wee ones! See our staff picks and our curated gift boxes for even more gifting ideas! Some of you count down the days to Thanksgiving all year long, and are excited to gobble up a meal that brings together family, friends and tantalizingly decadent dishes. Others dread the massive feast and that heavy, sluggish feeling that follows it - particularly, when you have to undo that top button of the pants you wore specifically because they were loose. Ugh! Regardless of which Thanksgiving camp you fall into, the day can be loaded with foods that make you feel, well, loaded. Sugar. Alcohol. Starches. Fat. Oh my! How do you avoid ending the night feeling like a stuffed turkey? 1. Digestive bitters, digestive bitters, digestive bitters - and digestive enzymes. The typical western diet is lacking in bitter foods, which help to jumpstart the production of digestive enzymes, bile and other digestive juices. Bitter tastes literally tell your entire digestive system, "Food is coming! Get working!". "Digestive Bitters" like those made by Urban Moonshine are traditionally used to support indigestion, nausea, gas, bloating, and balanced blood sugar levels. They encourage everything along the track - from our salivary glands to our intestines - to get the digestive party started. Consider grabbing a spray bottle of Urban Moonshine Bitters to stash in your purse or pocket Thanksgiving night. Take them about ten minutes before the big meal - and consider taking more after your meal if your gut needs a little extra love. For those of you who need something that packs a little more punch, you may want to give digestive enzymes a whirl. Digestive enzymes support the process of breaking down food into smaller, more absorbable and digestible molecules. On Thanksgiving Day, we tend to eat more food in general, and often consume more fat, sugar, dairy, gluten and alcohol than usual. Enzymedica’s Digest Spectrum is specifically formulated to support those who suffer from food intolerances. Digest Gold is a high-potency enzyme formula, great for supporting your body in breaking down carbohydrates, fats, protein and fiber. Lypo Gold is a fantastic choice for those who aren’t used to consuming the richer foods on the Thanksgiving table and could use a substantial dose of lipase to support efficient fat digestion. Digestive enzymes are most often taken right before or during a meal, but many people find them to be effective within 30 minutes of a meal. 2. Eat a wholesome breakfast and drink lots of water! It may seem counterintuitive to start your day with food when you know there will be so much more of it on your plate later. However, fueling your body in the morning can help you stave off some of the hunger pangs and low blood sugar crashes that can lead to overeating. Drinking enough water throughout the day can also support normal hunger levels and help your body process the high amount of salt that often comes with a heavy Thanksgiving meal. For those of you who are terrified about your crazy in-laws imposing their political beliefs upon everyone at the dinner table, we understand. For those who feel uneasy when there is enough food on your table to feed your family for a week and there are people starving in this world, we understand. For those who feel conflicted about the very origins of this 'Thanksgiving' tradition, we understand. Whatever may be causing your Thanksgiving Day anxieties, Urban Moonshine’s Joy Tonic could be the stress support that turns your day around. Formulated with uplifting herbs that promote peacefulness, inspiration and positivity, just a teaspoon of Joy Tonic can help provide that gentle emotional boost necessary to make it through the feast with a smile. If you are at all concerned about the high cholesterol in turkey, not to mention other heavy foods weighing down your plates (and stomachs) this Thanksgiving, taking plant sterols might be a worthwhile investment in your health. Since plant sterols have a similar structure to cholesterol, they support the absorption and metabolism of cholesterol so that it is eliminated through your stool. As you have probably heard us say, we are not doctors or pharmacists, but clinical studies and customer experiences demonstrate that plant sterols can lower total cholesterol and LDL-cholesterol. We recommend Plant Sterols 500 mg by Blue Bonnet. 5. GIVE THANKS! And, start those New Years Resolutions early. Get into the spirit of the holiday and express your gratitude for the people, experiences and transformations that have positively impacted your year. Alternatively, make some proactive commitments for how you will support your community (global or local) and honor your values in the year ahead. Share these with the table - positive affirmations can ease anxiety and bring joy to those around you in difficult times. Probiotics can be a great way to support the optimal environment for your gut. Cambridge Naturals Brand (including our line of Probiotics) is still on sale 20% off through the month of November! If you end up feeling bloated or gassy, Gaia makes a great formula called (seriously): Gas and Bloating. It includes some pretty remarkable digestive herbs. Get outside! A Thanksgiving hike will help burn those calories and get your digestive system humming along. Plus, you can avoid the crazy in-laws for another hour or so. And of course… come by the store or give us a call if you have any other nutritional questions!